n, k, ne, no, ke, ko Material properties ε1, ε2 MSE value Color values . Thickness of Si3N4 / SiO2 / Si3N4 [nm] features predefined or user defined patterns, extensive statistics, and graphical display of data as 2D color, gray, contour, +/- deviation from mean value and 3D plot. Execution of predefined recipes from a library. The recipes comprise thickness measurement parameters, models, fitting parameters, and reporting templates. and others allows modeling of nearly any type of material. SpectraRay/4 provides a user-friendly workflow oriented interface to operate SENTECH spectroscopic ellipsometry tools and a comprehensive set of tools to model, fit, and represent ellipsometric data. The user interface incorporates a recipe oriented operation for operators and an advanced mode for interactive measurement and modeling. SpectraRay/4 features uniaxial and biaxial anisotropic material measurements, thin film thickness measurement, and the measurement of layers. 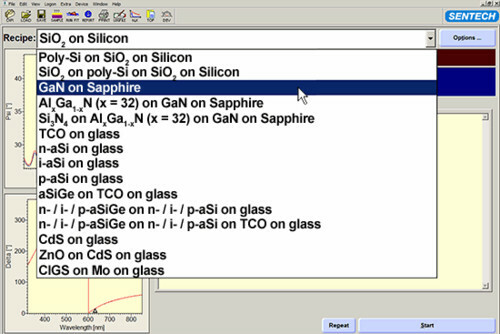 The software treats sample effects like depolarization, non-uniformity, scattering (Mueller-matrix), and backside reflection. SpectraRay/4 includes all utilities of general spectroscopic ellipsometry software package for data import and export (ASCII included), file management, arithmetic manipulations of spectra, display, printing, and reporting (in Word file format *.doc). The scripting capability makes it very flexible to automate routine measurements, tailor it for demanding applications, and control third party hardware like sensors, heating stage, sample cell or cryostat.